My husband's mother passed away last year and her sons have been cleaning out her house getting it ready to sell. It's a small clapboard house in a little town that previously belonged to my husband's grandparents so it holds many treasures. 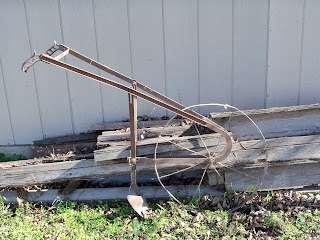 Out of all of the treasures to choose from, my husband brings home this rusty tiller. This old rusty iron tiller belonged to my husband's grandfather who used it often to till the land. My husband tells me he really likes it and thought it would good in front of the house so he stuck it in the front garden. Oh my, that big unusual thing in front of the house? for everyone to see? I went out and looked at it (for a long time). Of course, what could I do? It's important to my husband. So, we left it there. A few days later, my neighbor stopped by and told me how much she liked it. Then, my friend saw it and said how much she liked it. So, we are leaving it in the front garden...for everyone to see. He also brought home an old dresser and the cutest door. I'm a little more excited about the possibilities they hold. 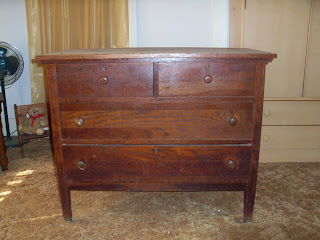 The old dresser is my next project. It has a mismatched knob so it will need a replacement knob which may be hard to find or all new knobs. It also needs to be re-stained or painted. I'm still deciding on exactly what I want to do with it. Here it is before and hopefully within a couple of weeks, we'll have an after! 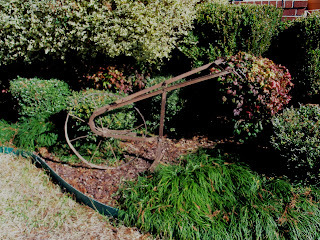 I'm enjoying looking around your blog,, I've bookmarked your site so I wont miss any cool posts in the future..ha ha.. your old tiller looks right at home in the flower garden. I have one of these that my Dad used in our garden when I was a kid. It now sits in my front flower/shrub bed and I grow sweet pea (flowers) vining up on it. It becomes a three dimensional trellis!